We’ve mentioned that you can reuse popular English designs for various EU markets; this usually applies to generic designs or popular English sayings like “Keep Calm and…”. However, depending on the audience you may find that translating your design and other elements can boost conversions and ad performance. This is especially true when it comes to Teespring’s Boosted Network. 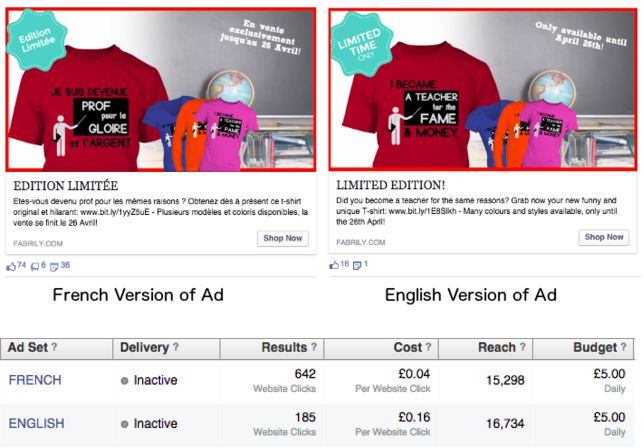 To test the importance of translations in Facebook ads we performed an experiment to see how an advertisement and design performed when translated versus not translated. 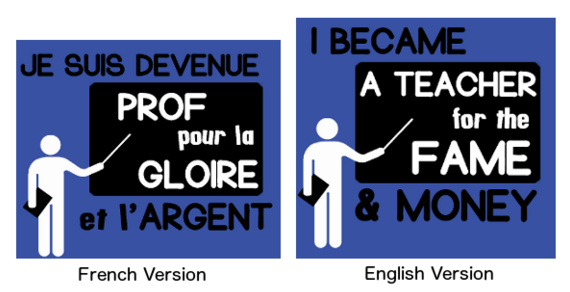 In this case, we tested a design targeting teachers in French-speaking countries. Our two Facebook ads specifically targeted France, Canada, Belgium, Luxembourg, and Switzerland. Our audience was identical in the two ads, including women aged 27 to 55, whose profession is related to teaching. One listing featured an English design with English title, description, and Facebook advertisements. 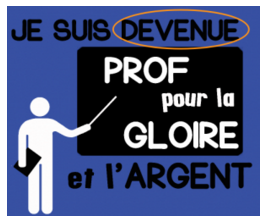 The other listing featured the same design, description, and Facebook ads, however everything was translated into French. Clearly we can see that our audience was more responsive to the advertisements and design featuring the French translation – and the cost per click was less expensive! So what have we learned from this? Based on our experiment (and other successful listings), if you plan to target non-English speaking buyers it’s a good idea to consider translating designs, title, description, ad image, and ad copy. Translated content can equal higher ad engagement, more clicks, and more sales! Don’t forget that many words in other languages have masculine or feminine properties; as you can see by looking at the design below, the French design says “devenue” which means “become”, and this term can only be used when referring to women. The male version would be “devenu.” For this reason we targeted the ads for females only as the gender specified in the design is for women. This brings up an important point about the fact that some European languages, like French (as well as Italian, Spanish and German, etc.) and may require two different words for each gender, and therefore 2 different designs to express the same message. It’s a good idea to check with your translator about the gender-specific words in your design – and to make sure you target the correct gender with your ads.